Tobacco control advocates around Southeast Asia on World No Tobacco Day expressed alarm that the tobacco industry is undermining a crucial bill, now under consideration in the Philippine Senate and House of Representatives, to require the industry to place pictorial health warnings (PHW) on cigarette packs. The Bangkok-based Southeast Asia Tobacco Control Alliance (SEATCA) is concerned about a looming possibility that the PHW Bill may be made ineffective by unprecedentedly weak provisions such as small, ineffective warnings at the bottom of the pack, a long phase-in period, and tobacco industry interfering with the warnings. Amendments accepted last week in the Senate included mandating DOH to consider recommendations of the tobacco industry in developing the picture health warnings. 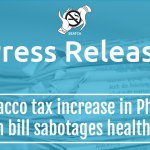 “This is a public health measure and legislators in the Philippines should not hand over implementation of this legislation to the tobacco industry or any agency that promotes this industry’s commercial interest over the health of the people. This would be like asking the wolf to protect the sheep. The Department of Health is the appropriate authority to enforce the Pictorial Health Warnings legislation,” said SEATCA Project Director, Dr. Ulysses Dorotheo. SEATCA has provided evidence to Congress on why large picture-based health warnings, more than 50 percent, placed on the top of the cigarette packs are more effective. SEATCA called upon Congress to subscribe to best and proven practices of PHWs such as large warnings of up to 80% on the top of the pack, phase-in period no longer than 6-9 months, stiff penalties for non- compliance, and national health authorities as implementors. These are already being successfully applied in over 70 countries in the ASEAN and throughout the world. For years, Filipinos, particularly smokers, received insufficient warning as the cigarette packs carried obscure and ineffective generic textual messages in English, which most young or illiterate smokers easily disregard. The tobacco industry has been allowed to practice double standards for so many years, given that, since 2004, tobacco companies in the Philippines have been exporting Philippine-made packs with 50% PHWs to Singapore and later to other ASEAN countries, yet denying Filipinos similar warnings. In 2008 the tobacco industry through its allies defeated an earlier Bill on pictorial warnings. In 2010, they sued the Department of Health when it required graphic health information on tobacco product packages. Now, the industry is again undermining the health policy (small pictures at the bottom that will be obscured when displayed and handled) and delaying implementation with a long phase-in period. Currently among the ASEAN countries Brunei, Malaysia, Singapore, Thailand, and Vietnam have PHWs. Studies and experience in countries like Brunei (which has one of the largest PHWs in the world at 75%) and Thailand (55%) have shown that larger pictorial health warnings are more effective, particularly in discouraging children from starting to smoke. Studies also emphasize the importance of positioning PHWs at the top of packs, rather than industry proposals to place the warnings at the bottom.